Albertsons - Food and drug stores. All-Clad - High-performance bonded cookware handcrafted in the USA by American artisans using American steel. Amazon Fresh - Free same-day and early morning delivery on orders over $35 of more than 500,000 Amazon items, including fresh grocery and partnered local products. Amazon Go - Cain of convenience stores in the United States operated by the online retailer Amazon.The stores are partially-automated, with customers able to purchase products without being checked out by a cashier or using a self-checkout station. Amazon Prime Now - Brings tens of thousands of products to your home with 1-hour delivery and 2-hour delivery. Andronico's - Specialty market for food and wine in San Francisco. Andronico's gives you the feeling of visiting your neighborhood grocer, butcher, baker, wine store, cheese shop, delicatessen, farmer's market, restaurant take-out, kitchen store and flower shop. BoulangEpicier - Alain Ducasse's tiny new shop in the 8th arrondissemont showcases the chef's favorite staples: late-harvest vin jaune vinegar, sea-salt caramels and miraculous breads from uberbaker and co-owner Eric Kayser. Belcampo Meat Co. - Belcampo is a lot of things: a farm, a processing plant, a neighborhood butcher shop, a restaurant. What unites everything it does is its singular commitment to provide delicious, organic, and humane meat you can feel good about buying and eating. Ben & Jerry's - Ice cream, frozen yogurt and sorbet. Caffe Roma - Founded in 1989 by Anthony and Sergio Azzollini, Caffe Roma is built on the experience of three generations of the Azzollini family. Father Sergio came to San Francisco from Italy over 30 years ago to open the first coffeehouse on Columbus Avenue in 1977. Anthony was born in the United States and Roma is driven by Tony's passion for coffee - excellent coffee. Capay Valley Farm Shop - Organic vegetables, fruits, nuts, meats, olive oil, wine, lavender, honey, flowers, and more. Charles Chocolates - Premium chocolates. Located in Emeryville, California. Cheese Plus - San Francisco's premier cheese and specialty food store. A cozy neighborhood shop located on the sunny corner of Polk and Pacific in Russian Hill, Cheese Plus features the finest cheese from the U.S. and around the globe as well as as an excellent selection of fine culinary products including Northern California artisan produced charcuterie, chocolate, specialty condiments, oils and vinegars, and our own house made sandwiches, salads, and spreads. Cheese Plus is owned by Ray Bair. Prior to creating Cheese Plus, Ray was director of cheese, wine, and specialty foods for Whole Foods Market. Well regarded for his travels across the country and throughout Europe, Ray is constantly searching to find the source of authentic and traditional cheese and specialty foods. Chef Tools - Kitchen tools, cooking gadgets, bakeware, decorating supplies for chefs & cooks. Videos, recipes, reviews and tips. CHEFS Catalog - Offers products for the kitchen from the world's top brands, including All-Clad, Calphalon, Cuisinart Cookware, Cuisinart Electrics, Henckels, KitchenAid, Le Creuset, Waring, and Wusthof. Chipotle - Gourmet burritos and tacos. Clearwater Fine Foods - Lobster and premium shellfish. Cooking - Cookware, accessories and specialty foods. Cowgirl Creamery - Producing organic cheese in Point Reyes Station, California, and promoting artisan cheesemakers throughout the U.S. and Europe. Culinary District - Ingredients, supplies and equipment for the chef. Provides the best of imported and domestic food items, high quality ingredients, commercial cookware, equipment, cutlery, specialty tools, china and glass ware, table top, packaging for food products, bakeware and plenty of ideas for using all of these items. Dean & Deluca - Fine foods, kitchenware, gifts. Dean's Beans - Specialty certified organic, kosher coffees roasted in small batches in Orange, MA. 100% organic and fair trade. Drannan Cookware Co. - Maker of the remarkable stainless steel WaterBoiler/WaterRoaster Pan invented by Lee Drannan Smithson. Drink the Leaf - Exceptional loose leaf tea from around the world. EthnicGrocer - Online provider of authentic ethnic products. Fentimans - Botanically brewed beverages: Ginger Beer, Curiosity Cola, Victorian Lemonade, Shandy, Mandarin and Seville Orange Jigger, Dandelion & Burdock. Fiscalini Cheese - A rich dairy tradition, hand-crafted farmstead cheese, award-winning taste. Locarted in Modesto, California. Borough Market - London, England. The market has grown to over 100 individual stalls. Alongside its fruit, vegetables, bakers and butchers, it now also sells a huge variety of British and international produce. Castries Market and Vendor's Arcade - The largest open-air market in Castries, Saint Lucia. English Market - Cork, Ireland. Roofed food market, trading since 1788. Ferry Plaza Farmer's Market - A California certified farmers market operated by the Center for Urban Education about Sustainable Agriculture (CUESA). The market is open two days a week - Tuesdays and Saturdays. The large Saturday market is held both in front of the Ferry Building on the Embarcadero and on the rear plaza overlooking the Bay. On Tuesday, the market spills out of the arcades onto the Embarcadero sidewalk. The markets offer produce and flowers from small regional farmers and ranchers, many of whom are certified organic. A wealth of other products include regional artisan specialties such as breads, cheeses and jams. Kauppatori Market (Helsinki Market Square) - A central square in Helsinki, Finland, and one of the most famous market places and tourist attractions in the city. Kowloon City Wet Market - Hong Kong. Newly caught and newly picked is the key: fish swim around in tanks; crabs and lobsters with their claws secured eye shoppers nervously; and an abundance of vegetables transported from the farms of the New Territories and China pack the myriad of stalls. Kreta Ayer Wet Market - Singapore. As one of the top markets in the world, Kreta Ayer Wet Market also offers consumers a walk on the wilder side of food with a selection of live frogs, snakes, eels and turtles along with preserved eggs. La Merced Market - A traditional public market located in the eastern edge of the historic center of Mexico City. Lancaster Central Market - Lancaster, Pennsylvania, USA. The country's oldest farmers' market, in the heart of Amish country occupies a beautiful 120 year old red brick building chock-full of local character. Regional food specialties include Pennsylvania Dutch sausage, scrapple (a breakfast meat of pork scraps and cornmeal), and headcheese (like scrapple, an acquired taste). Home to over 60 local venders showcasing the best locally grown fruits and vegetables, jams and jellies, relishes and more. Marche Provencal - Antibes, France. A magnificent selection of meat, fish, cheese and vegetables. Mercado Central - Santiago, Chile. Offering seafood, grocery, herbs, fish, butches, deli, bakery, and more. Widely known for its traditional dishes, seafood, nearby local fruits, freshness and seasonality of food. Mercado Municipal de Sao Paulo - Sao Paulo, Brazil. One of the most traditional gourmet points of the city. Find a wide variety of foods, from fresh vegetables and fruits to meat, poultry and seafood of all kinds, pasta, sweets and top of the line spices from different parts of the world. Mercado Ver-o-Peso - Belem, Brazil. Covers over almost 35,000 square meters (9 acres) of land, and is divided into subsections selling meat, fish, fruits (including a specialized market selling only açaí), arts and crafts, and prepared food. Mercat de la Boqueria - Barcelona, Spain. Fresh, natural, local products of the highest quality. Over 250 stalls. Mercat de Sant Josep de la Boqueria - A large public market in the Ciutat Vella district of Barcelona, Catalonia, Spain. Mercato Coperto (indoor market in the Via Albinelli) - Modena, Italy. All types of food are sold on the market stalls, with a wide range of typical and certified products, such as traditional balsamic vinegar of Modena, Amaretti of Modena, the cherries of Vignola, Lambrusco doc of Sorbara, Grasparossa di Castelvetro and Salamino di Santa Croce, crescentine (or tigelle), zampone and cotechino, Parmigiano Reggiano cheese, Modena ham, as well as more local specialities. Or Tor Kor - Bangkok, Thailand. An incredible range of fruits, fresh vegetables, meats and seafood. Pike Place Market - Seattle, Washington's ustling center of farm fresh, locally sourced, artisanal and specialty foods. Queen Victoria Market - A major landmark in Melbourne, Australia, , offering a variety of fruit and vegetables, meat, poultry and seafood, gourmet and delicatessen foods as well as specialty delicacies. Selfridges Food Hall - Birmingham, UK. St. Lawrence Market - Toronto, Ontario, Canada. Over 120 specialty vendors, known for the variety and freshness of their fruit, vegetables, meat, fish, grains, baked goods and dairy products. Sydney Fish Market - The largest market of its kind in the Southern Hemisphere and the third largest seafood market in terms of variety in the world. A working fish market, SFM sources product both nationally and internationally and trades over 14,500 tonnes of seafood annually - with up to one hundred sustainable seafood species traded every day and approximately 500 species traded annually. Tsukiji Market - Tokyo, Japan. Fish, vegetables, fruit, meat and flowers. One of the world's largest fish markets, handling over 2,000 tons of marine products per day. Also see Tsukiji Fish Market article. Union Square Greenmarket - New York City, USA. Founded in 1976 with a two-fold mission: to promote regional agriculture by providing small family farms the opportunity to sell their locally grown products directly to consumers. Has grown to become the largest and most diverse outdoor urban farmers market network in the U.S., now with more than 50 markets, over 230 family farms and fishermen participating, and over 30,000 acres of farmland protected from development. Yeliseyevsky - Moscow, Russia. One of the most beautiful and rich food emporiums in the World. FoodSpring - Brought to you by the National Association for the Specialty Food Trade (NASFT), a non-profit organization comprised of more than 2,900 producers of hand-crafted, natural, organic and ethnic foods, foodspring.com provides an insider's look at these specialty foods and the people who make them. Since 1952, the NASFT, with the help of its bi-annual trade-only Fancy Food Shows, has cultivated strong relationships with a countless number of domestic and international food producers, specialty food stores, restaurants, famed chefs and culinary schools-all helping it stay in the lead on what is new and exciting in the world of food. 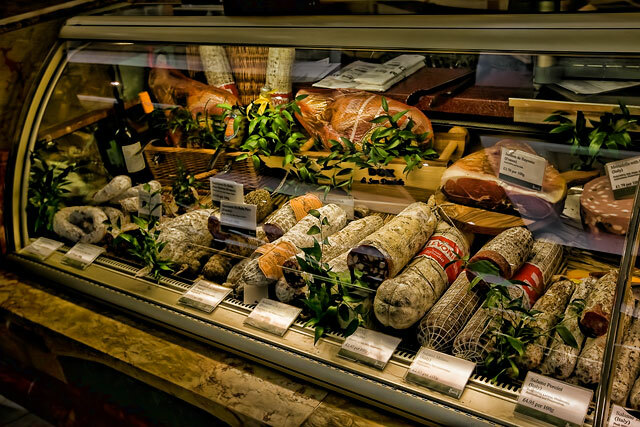 Fra' Mani Handcrafted Salumi - Brings the art of traditional Italian salumi to America's discriminating palates. Located in Berkeley, California. Note: Salumi is Italian for salted, cured cuts of meat or sausages made primarily from pork. Fungi Perfecti - Gourmet and medicinal mushrooms. Guaranteed Parts - Carries the leading parts of all major appliance brands. German Deli.com - Over 5,000 imported German food and groceries including butter and cheeses, tender hams smoked in the Black Forest, salted herring from the North Sea, juicy German-style sausages, delectable candies, authentic German Gummibaren (Gummi bears), German chocolates, ready-made cakes, delicate cookies, hearty soups, cake mixes and baking aids. Gevalia - Direct delivery coffees and teas. Gourmet Depot - A leading source for small appliances, parts and accessories, such as blenders, food processors, stand mixers, coffee makers, juice extrators, etc. Grande - World class dairy products, Italian cheeses. Harrod's Food Hall - Fine wines, chocolates, and gourmet foods. Indian Harvest - Gourmet rice, grains, and beans. Jean Dubost - Creates and manufactures a wide range of flatware, kitchen knives and giftware, this under five different brands since four cutlers generations. Jeremiah's Pick Coffee - Quality fresh-roasted coffee. Kalustyan's - Spices, herbs, seasonings, sweets, chutney, Indian, beans, coffee, tea, roti. Kosher Supermarket - Kosher and Jewish foods, including groceries, condiments, dairy products, sweetshop/confectionery, baked goods, fish products, frozen foods, poultry/meat, deli counter, gift and specialty items and Passover/Holiday products. La Boulange Cafe and Bakery - Organic breads and specialty pastries. Les Trois Petits Cochons (The Three Little Pigs) - Natural pates, pate, foie gras, terrines, charcuterie, sausage. LU Biscuits - Premium European cookies made with the finest ingredients, including rich chocolate and pure butter. Lucky Dog Ranch Beef - Provides great tasting healthy beef to Farmer's markets and restaurants in Wine Country, San Francisco Bay Area and Sacramento Valley. Marin French Cheese - Located north of San Francisco, east of Napa County, west of Pt. Reyes and Olema and south of Sonoma County, Marin French has produced hand crafted Artisan soft ripened cheese since 1865. Rouge et Noir cheeses similar to French and European varieties but reflecting the characteristics of Northern California. Master Foods - Specialty foods. McEvoy Ranch - Located on 550 acres in Petaluma, California, McEvoy Ranch produces organic olive oil and seasonal produce. They offer public tours and have a retail store at San Francisco's Ferry Building Marketplace. Neal's Yard Dairy - Farm cheeses from the British Isles. Buys cheese from seventy cheesemakers on farms around Britain and Ireland and we sell the cheese in our two shops in London and to shops and restaurants all over the world. NetGrocer - Groceries, drug store products, cleaning needs, pet supplies and more. Omaha Steaks - Corn-fed mid-western beef. Organic Express - Delivers organic produce to your home or office. Parmigiano-Reggiano - Historical evidence shows that already in 1200-1300, Parmigiano-Reggiano cheese had reached its perfect typicality that has remained unchanged until the present day. This means that the dairy activity in the production region certainly has very old origins, since it can be reasonably assumed that the unique features of the product had already been reached long before then. The Parmigiano-Reggiano standard is, in fact, an evolution of ancient and extraordinary cheeses - already mentioned by Latin authors - determined by a constant improvement of cheese making techniques. Parthenon Foods - Imported food from around the world. Peck - Milan, Italy. Promoting rare artisanal specialties, made by small producers often overlooked by large retailers. Plantin - An ambassador for the french truffle. Real Food Company, The - One of the original neighborhood natural food stores. Five San Francisco Bay Area locations. Recchiuti - Chocolates. Located at San Francisco's Ferry Building. Richart Chocolates - French gourmet chocolates since 1925. Riga Gold Smoked Sprats - Imported from Latvia. Riga Gold Sprats are a unique delicacy that are popular in Europe. Revered in the former Soviet Union, they have been produced in Latvia since the 19th century. Riga Sprats are smoked using traditional practices and packed in oil. Round Pound - Artisan olive oils, vinegars, and limited-production wines. Safeway - There are approximately 1,820 Safeway stores across the US and Canada. These include 325 Vons stores in Southern California and Nevada, 113 Dominick's stores in the Chicago metropolitan area, 137 Randalls and Tom Thumb stores in Texas, 38 Genuardi's stores in the Philadelphia area, as well as 17 Carrs stores in Alaska. Salumaria Biellese - Making sausages and salamis since 1925. Located in New York City. Scharffen Berger - Artisan chocolates. Send - Scotch, champagne, wine, fine foods. Sheana Davis & The Epicurean Connection - Located in the heart of Sonoma, Calif., at 18816 Sonoma Highway C, with a fine selection of artisan and farmstead cheeses, fresh pasta from the Pasta Shop including Delice de la Vallee Raviolis, Sonoma County Dairy Products, Sonoma Valley Olive Oils, fresh canned preserves and more. The first Thursday of each month is non-profit night with a complimentary reception and 10% of the day's sales going towards the selected community non profit. Shopper's Guide to Pesticides in Produce - This Environmental Working Group guide highlights fresh fruits and vegetables low in weed-killers and bug-killers. Smithfield - Smithfield country hams, Virginia peanuts, gift baskets, Chesapeake seafoods, smoked turkeys, Smithfield Lean Generation pork, and gift samplers. SodaStream Penguin Earth Friendly Glass Carafe Soda Maker - Penguin home soda maker, one 60L CO2 carbonator to fizz up to 60 carafes; 2 reusable cut glass carafe with fizz preserving caps. Stilton - Britain's historic blue cheeses. Sweet Maria's - Coffee supplier. T-fal - Cookware, cooking appliances, bakeware, tools and gadgets, steam irons. TAZO - Teaologists: filtering tea, full leaf tea, tea lattes, bottled tea, and iced tea. Tobasco - The hot, legendary pepper sauce. TSP Spices - Organic spices. Uplands Cheese - Makers of Pleasant Ridge Reserve, an artisanal farmstead cheese made in the style and tradition of mountain cheeses from the alpine regions of France. Located in Dodgeville, Wisconsin. Urban Space - Bringing a dynamic array of food and design to unexpected public venues in New York City. Vella Cheese Company - Hand made, hand cut cheeses. Victor Churchill - Butcher shop in Woollahra, a suburb in the eastern suburbs of Sydney. Vital Tea Leaf - Modeled after a wine bar, with complimentary 'try before you buy' tastings, and with an inventory of more than four hundred teas in our stores, Vital Tea Leaf offers the finest and most varied selection of teas from China, Taiwan, and Japan available on the West Coast of the United States. Three locations in San Francisco's Chinatown, and one location in downtown Seattle near the Pike Place Market. Waiter - Restaurant ordering service. Wedge Co-Op - natural foods cooperative grocery store. Williams-Sonoma - Home-centered specialty retailer in the U.S.
Zingerman's Community of Businesses (ZCoB) - A family of small food related companies in the Ann Arbor area. Each is operated by one or more managing partners who share ownership and work in the day-to-day running of the business. This webpage last updated on Saturday, March 9, 2019 11:22 AM.